The inauguration ceremony was organised by Think Playgrounds (TPG) social enterprise, the Live and Learn Vietnam centre, the women’s union of Dong Anh district and partners. The project was constructed under the support of the France - Germany Cultural Fund, the Goethe Institute in Hanoi, the French Cultural Centre (L'espace) in Hanoi, the Ford Vietnam and other sponsors. 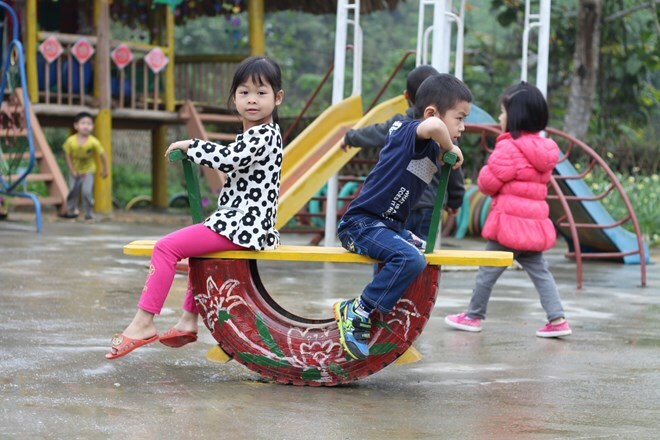 Director of the Goethe Institute in Hanoi Wilfied said this is the first playground designed by many famous experts of France, Germany and Vietnam who are working in designing play spaces for children. The playground is a combined project of the event “Play Campaign” and the idea of building a recycled playground together with the community in Dong Anh district, which aims to raise public awareness of free playing in public areas and the importance of using recycled materials to contribute to reducing urban waste. A festival to encourage playing with recycled toys was also organised the same day. Nguyen Tieu Quoc Dat, co-founder of the TPG, said this is the 106th community playground built by TPG, adding that it demonstrates that local communities and organisations play an important role in promoting construction of public spaces for all people.